Everyone loves the carrying convenience of a full-featured tote bag. Made from sturdy earth-friendly 50% recycled 600-denier polyester, this versatile unit measures 15" x 13" x 4" and provides plenty of room for odds and ends or trade show brochures. Several handy pockets make this bag unique. In addition to the zippered main compartment, you'll find a contoured main front pocket right next to the pencil, water bottle, and cell phone holders. Open up the main compartment, and you'll discover an additional 8" x 9" zippered hanging pocket. Featuring adjustable handles and a matching color hanging ring, this is one tote that stands out from the crowd. 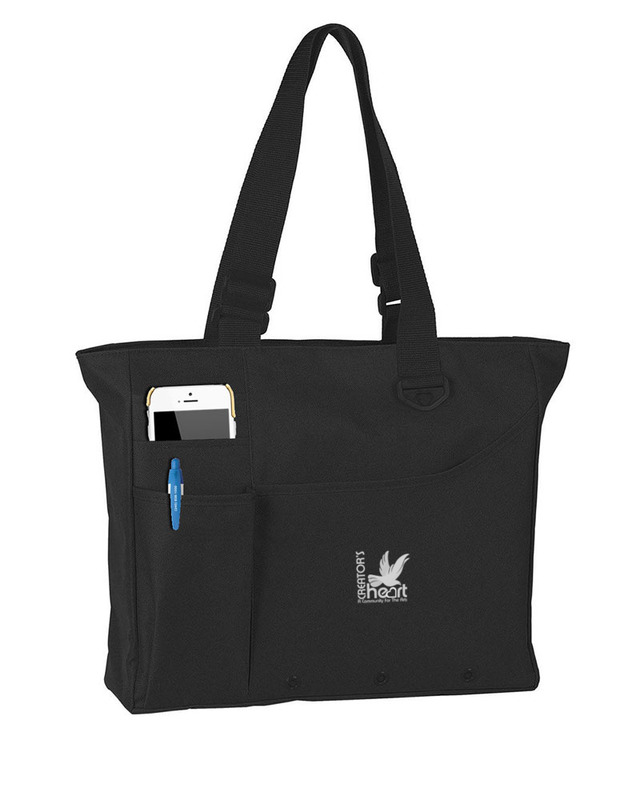 Put your logo on a friendlier tote bag at an eye-catching price.